Victoria's Six Pack Samplers are a wonderful way to try out our favorite fragrances or you can choose your own favorite fragrances and create wonderful scent combinations for your home. Our 8 oz. 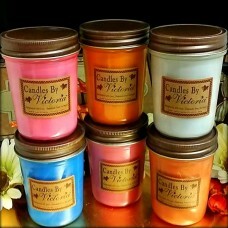 candles come in a cute country style jar and include a lid. Treat yourself or give them as gifts! Save 5.00 by ordering our Sampler Pack! Discount codes will not apply to this product.